In a similar fashion to Maxi Iglesia’s portrait, for Natalia de Molina we decided to also use a home-made modifier, and after trying different things, we really liked the pattern which the Thermomix’s simmering basket projected. Natalia is a beautiful, talented actress who looks amazing on camera, so we knew we could be bold and use pretty much anything, because she always looks great. Once again we went for continuous light, because we found out that if we used the flashes, the light was way too strong and the patterns didn’t come out as nicely. We used the Picolite with a snoot, with the basket standing in front of it at about 1m from the light source. 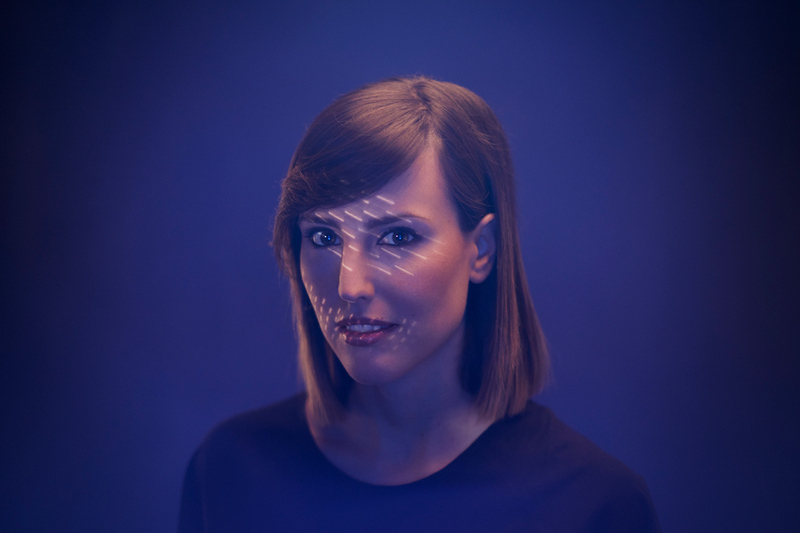 We also had a 75 Octa above the model, really close to her (using the modeling light), and a vertical strip as a backlight. Finally, we used another 75 Octa for the background. As predicted, she looked amazing and misterious, with a touch of noir-film femme fatale which we loved. Finally, we had to shoot a group photograph with all the actors and directors who had taken part in the Cinergía shortfilms, 13 people in total. They’re all famous spanish artists, so it was literally impossible to get them all on the same day, so we had to shoot this photograph on two separate days. This meant we had to shoot the first half of the photograph and then leave the set, the lighting and, ideally, the camera in the exact same position so that when we shot the second half one day later, the two would match and would be easily composited together. As for the set design, we knew we needed to keep it simple so that the focus was on the people, and that we needed to have different heights so that we could place them in a way where we could see them all and it was harmonious. We also wanted to add a little futuristic touch, because that was in the shortfilms also. 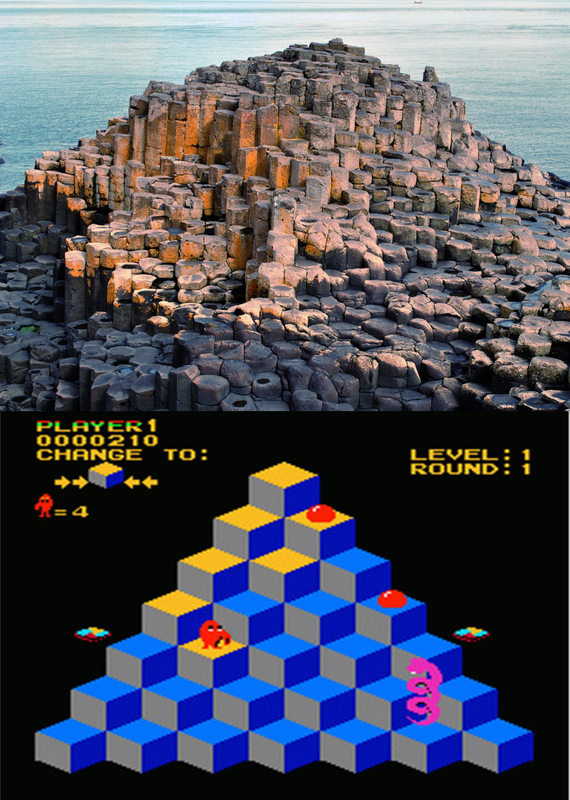 We came upon the idea of using geometric shapes of different sizes to build a sort of cubed-landscape, losely inspired on the Giant’s Causeway in the UK, or the Qbert videogame. We liked the isometric perspective of the cubes, which added depth to the photograph. We used a 3D rendering software to see how many cubes and of what sizes we would need to cover the area we wanted, and then we had them built and delivered to our studio. As for the lighting, this one was kind of tricky. We needed to cover a large area, and also set the lights for some people who wouldn’t be there in the first place. Of course, we used stand-ins for composition and lighting, knowing that once we shot the first half, we would be attached to that for the next day, as making modifications would make the stitching job harder. This was shot using flashes, and we literally used every flash we had, mainly our beloved Siros which were hanging above the set on a truss with diffusion softboxes. The ability to set the Siro’s intensity remotely using a smartphone is perhaps the best thing since the invention of the wheel. We didn’t need to keep lowering the truss or climbing up some ladder whenever we needed to make some adjustment, we just had our assistant do it from her phone. We used bars across the truss so that we could place some of the flashes as backlight, and some of them directed more to the front of the models. We also had lights behind the cubes for the background, and some lights placed on booms to fill the models who were closer to the camera. We couldn’t afford to leave the camera locked in position from day 1 to day 2, because we needed to shoot some of the portraits in between, so we just locked a tripod tightly in place, surrounded by fences and menacing signs, so that we could replicate the framing on day 2.